I have flown a fair bit with KLM this year, some flights in business class and others in economy, most of these flights were across Europe. However, I also flew between Singapore and Bali as part of my trip with Air France. 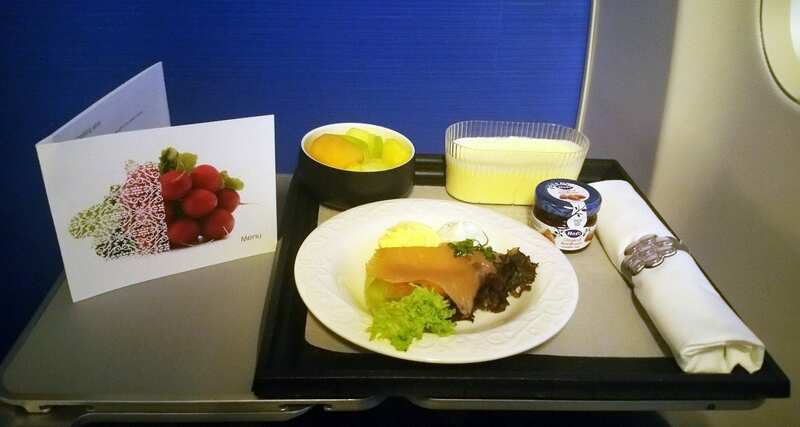 KLM still offer free meals in economy class, even in Europe, and on select long-haul flights, you’re able to upgrade your economy class meal for a fee and receive a fantastic pre-order meal. I’m yet to try these but will get around to it one day, for further information on KLM meals you can view the info page right here. So enjoy the KLM inflight meal experience, an assortment of images of Breakfast, Lunch and Dinner in business and economy class on a variety of different sectors and aircraft types. The following business class breakfasts were inspired by the dishes of Michelin 2 star chefs Onno Kokmeijer and Arjan Speelman. The first is an excellent offering on this very short early morning departure from Copenhagen to Amsterdam. A tasty yet straightforward offering of fresh fruit, curd cheese and fresh smoked salmon served with cucumber cream cheese. Very nice! The second Michelin inspired breakfast option from Amsterdam to Lisbon didn’t disappoint either, with a flight time of 2hrs and 40 mins a delicious hot meal was served on a much bigger tray. The Leek frittata was paired with some very delicious potatoes and tomato chutney. The cold platter of fenugreek cheese and the chicken breast was a great starter, and it was served with fruit on a stick and yoghurt. What a great looking lunch and check out that colourful appetiser! Served onboard a flight from Lisbon to Amsterdam this lovely dish of Chicken thigh in jus served with pearl barley risotto, green beans and pan-fried mushrooms accompanied by an orange mousse and chocolate ganache. Seriously great food. How about this delicious meal tray served on a flight between Singapore and Bali, Chicken satay with rice served with a side salad and a delicious passion fruit tart. And we can’t forget economy class, KLM’s sandwich boxes are well known to regular passengers and are very cute indeed. Expect something similar to this to be served to you on short hops across Europe.